The company formerly known as Surfango (they’re now called Jetbuster) have unveiled the newest beast to emerge from their Dusseldorf HQ. The Jetrider XL can reach speeds of up to 25mph thanks to a tough 9.5hp engine. It’s comfy too. Of course, the real innovation of the Jetrider isn’t its performance but something a lot more subtle. That would be its seat. Where bruised bums were the norm in previous Surfango/Jetbuster models, the Jetrider takes a different approach thanks to an Air-Shox suspension system that lets the Jetrider roll along with the waves. 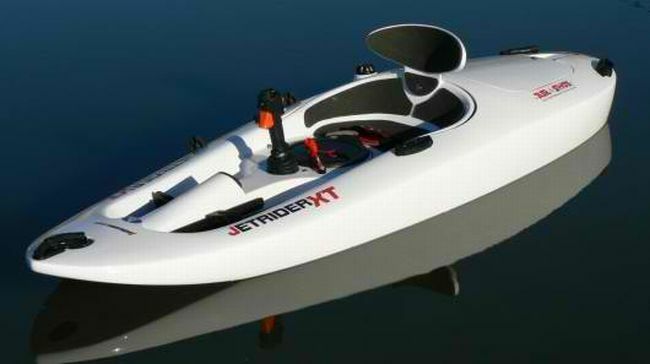 The Jetrider XL works splendid on most bodies of water except the open sea where currents might be excessively rough. At just 139lbs it’s also portable and transport friendly, so this means the Jetrider XL goes wherever the spirit of adventure beckons. The Jetrider and its siblings can be viewed at the official Jetbuster site. Here’s the bad part. An aquatic ride like this will set you back $2,999.